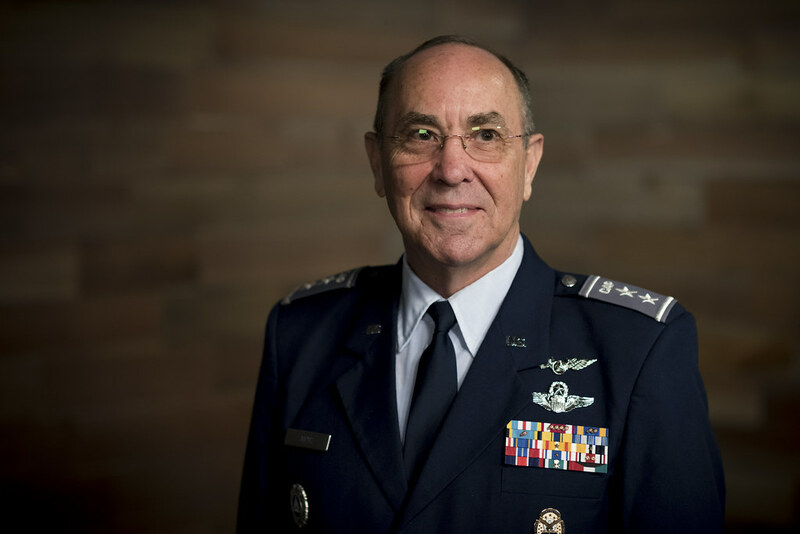 In December 2018, Airman magazine interviewed Maj. Gen. Mark E. Smith, the Civil Air Patrol’s 24th national commander. 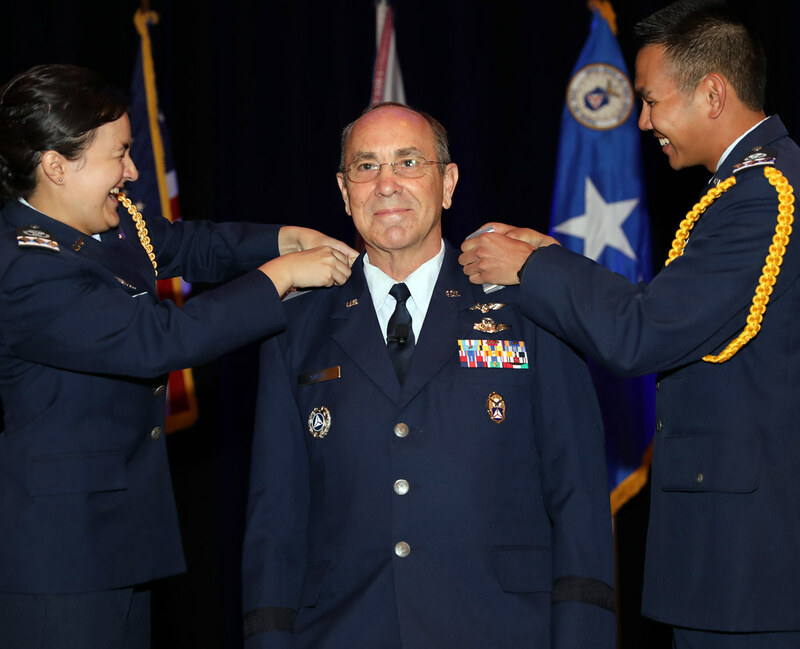 He leads CAP’s more than 60,000 members across the United States in fulfilling the U.S. Air Force auxiliary’s Congressionally chartered missions of emergency services, cadet programs and aerospace education, in addition to the organization’s steadily increasing role in U.S. homeland security as the newest member of the Air Force’s Total Force. Airman Magazine: You’ve had a very long and varied career. 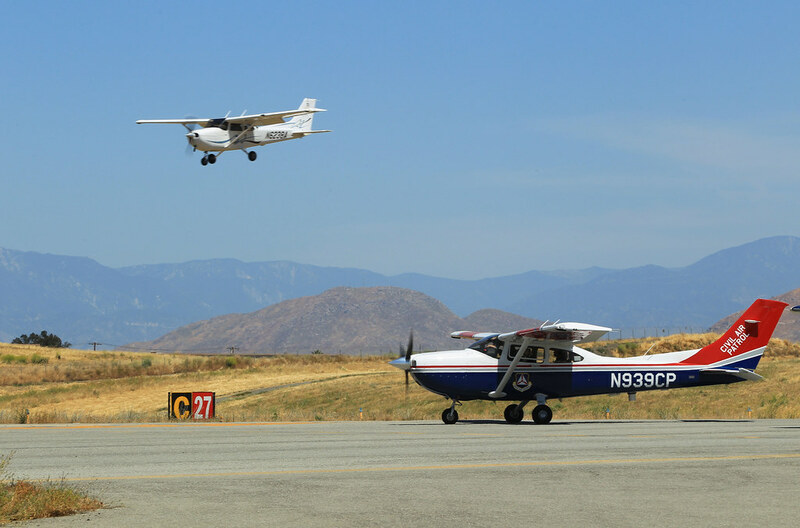 What sparked your interest in aviation and the Air Force and how did that lead to becoming the national commander of the Civil Air Patrol? But, the reality was that I lived in a little-bitty camping trailer behind an auto garage in a town that if you counted all the ranches was about 135 people out in the desert of California. The family dynamics were not particularly healthy, so there was not going to be any way that these types of dreams were going to be realized. Near where I went to high school, in the town of Lone Pine, California, 23 miles away, there was a fellow who was a Korean War era veteran, an Air Force fighter pilot. He found out what my interests were and he was the area liaison for the Air Force Academy. He mentored me through the process to apply to go to the academy. I was accepted, graduated and went to pilot training. I started out in the F-4 (Phantom II) and then ultimately into the F-15 (Eagle), where I spent most of my time. So I love to talk to young people about the power of mentorship because it’s something that made a fundamental difference in my life and being able to achieve my life goal. Mark Smith, left, was a high school student in Lone Pine, Calif. when Air Force Reserve Maj. Ray Powell took him under his wing and guided him to the Air Force Academy. Airman Magazine: Who was that F-86 Sabre pilot? Maj. Gen. Smith: He was Air Force Reserve Maj. Ray Powell. He ultimately became Lt. Col. Ray Powell. He was the positive influence in my life, of course, up until I got married, but he was the positive in my life through when I was promoted to colonel within the Air Force just before he passed. We all have people that we can go back and say, “that person made a fundamental difference in my life.” Ray Powell was that person for me. I spent 26 years in the Air Force, then I was in industry afterwards, other nonprofits, served as my wife’s caregiver for several years and was doing CAP on the side; a wing commander, region commander and then into this job. It was not on my radar scope to do the job. I was, you might say, “encouraged” to apply for the position, and I was finally beaten into submission, put a package in and here we are in the best job in the world. Airman Magazine: You kind of breezed past those 26 years in the Air Force, but that included a combat tour and I am sure a lot more. Could you tell me about that? Maj. Gen. Smith: My combat time was in Desert Storm as part of the 1st Fighter Wing; Desert Shield and Desert Storm operating out of Dhahran (Saudi Arabia). I was, at the time, the assistant chief of stan/eval (standards and evaluation) leading up to Desert Shield. One of our additional duties, if a contingency comes up, is getting the deployment done, the airplanes and the pilots. So we deployed 48 aircraft and my boss, the chief of stan/eval, wrangled his way into the flight lineup. They go, and I’m still sitting at Langley (AFB) saying “something’s wrong with this picture.” It took me a couple more weeks to actually get over there to the desert. They gave me some folks and said, “Okay, turn them into a flight. A four-ship flight that’s combat ready.” We did that over the course of Desert Shield. We employed as a four ship or multiples of four ships during the course of Desert Storm as well. Airman Magazine: Please tell me a little bit about what your duties are now. What it is that you do for the CAP? Maj. Gen. Smith: I’ll first say, we have people from absolutely every walk of life; it is amazing! That’s one of the riches of this organization. When I first joined, based on my background, I wasn’t sure if this was going to be a good fit for me. And what happened is I fell in love with the people. These are amazing people who are giving of their time, treasure and talents to serve community, state and nation and doing a wide variety of amazing things. So, you know, what’s not to like about that? Then the stick and rudder flying, of course I love airplanes, love flying and it’s nice to still do that. But for me, and I would say really for everybody, those of us who have worn the uniform with whatever branch of service it might be, it’s a way that we can continue to serve. So that’s number one. You know, I bleed Air Force blue. I’ve got the core values that are burned into my DNA. That service, that excellence, that integrity, the moral framework and the fabric that we have within the CAP is something that, certainly those of us who were or are in the Air Force, can easily identify with. So. back to your question. First, remember that CAP is fully the auxiliary of the Air Force and it is fully a congressionally-chartered nonprofit corporation, as well. So in my position, I am the national commander, the person in charge of this military-looking type of structure, but I’m also the chief executive officer for this large nonprofit corporation, as well. From the business perspective, I’m working with the chief operating officer, and with 135 paid employees and about another 75 to 80 volunteers at the national level for the staff. All the resources that we have; the budgeting, the strategic planning and then the volunteers, is a one-team concept in our pursuit of excellence in performing our missions – those three Congressionally-chartered missions, as the Air Force auxiliary, the federal level and state and local level where we can help make a difference. Members of the Ohio Wing's Group 514 stand in formation at Cleveland Municipal Airport circa November 1942. Airman Magazine: Could you tell me about the history and the origins of the CAP? Maj. Gen. Smith: It’s a wonderful story. The individuals who played a key part of starting the CAP had their beginnings as war fighters in the First World War. Gill Robb Wilson and his brother were World War One-era aviators for the US. Gill Robb Wilson saw his brother go down in flames and that burned into his psyche; what war is all about. Then there’s a name that a lot of folks have heard, (Fiorello H.) La Guardia, who was mayor of New York. He was also in charge of the federal level civil defense efforts. Back in the day of the civil defense, it’s a bunch of volunteers; folks like a Gill Robb Wilson, folks like Secretary Wilson’s grandfather (George G. “Scotty” Wilson) who said, “what can we do as aviators to help the cause? If we get into conflict, what can we do to help to relieve the pressure on military, to put their resources where they need to be”. So they worked with La Guardia and the CAP was chartered on December 1, 1941, just six days before Pearl Harbor. From that day on through World War II, through those darkest times, CAP was performing missions with people paying their own way, providing their own aircraft and doing amazing things to help. The next year, October 1, 1942, it was recognized that there were a lot of young people wanting to be involved in helping as well. So that day was the start of our cadet program within CAP and young people were actively engaged to make a difference for that war effort. They were wearing CAP uniforms, learning the basics, and many of them going on to serve in the military. We had individuals that went on to be a Tuskegee Airmen, ladies who flew with the WAAFS (Women’s Auxiliary Air Force). Later in the war, Col. Gail Halvorsen, who everybody knows from the Berlin Airlift, the Berlin Candy Bomber, had his start as a CAP cadet. Especially during the initial dark days when we were building up our resources on the military side of the house, one of the biggest things was German U-boats would come right in close to shore and would be sinking the oil tankers. We were losing significant numbers of tankers to these U-boat attacks. 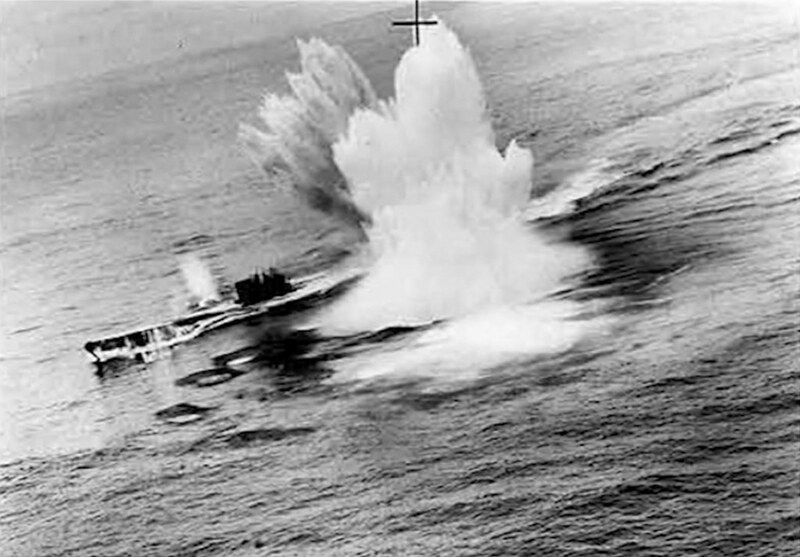 CAP was asked to perform coastal patrols looking for these German U-boats and attacking many of them with 100-pound bombs mounted on private planes, but the bottom line result was the German U-boats were forced offshore which resulted in being able to solve that problem of all these ships being sunk. Whenever a patrol spotted a U-boat, the crew broadcast its position to merchant ships in the area, as well as to the Navy and AAF. The CAP plane then stuck with the sub as long as possible to vector in any intercepting forces. The patrols also radioed in reports of tankers and merchant ships that had been hit, and the position of survivors in the water. CAP claimed its first U-boat kill on July 11, 1942, when Captain Johnny Haggins and Major Wynant Farr, flying a Grumman G-44 Widgeon armed with two depth charges, bombed a sub they had been shadowing for three hours, just as it came up to periscope depth. Lots of other missions as well—search and rescue, fire courier service, towing targets for gunnery practice—anything that we could do to help with the war effort and that degree of service has gone all the way up to the present. Airman Magazine: Do those same types of missions still exist today? Maj. Gen. Smith: Absolutely. You can see those early missions still being done today. The technology has changed a lot, but a lot of those missions are the same. The type people we have are the same, and the spirit of service is the same. We may not be towing targets anymore, but we are still helping with air defense. One of the most challenging things that the F-15 and F-16 Fighting Falcon (pilots), who are in the air defense mission, practice is (intercepting) low and slow flying targets. We’re a perfect choice for that. Multiple times a week throughout the course of the year, we’ll act as an intruder in a low and slow airplane going into airspace where they shouldn’t be. 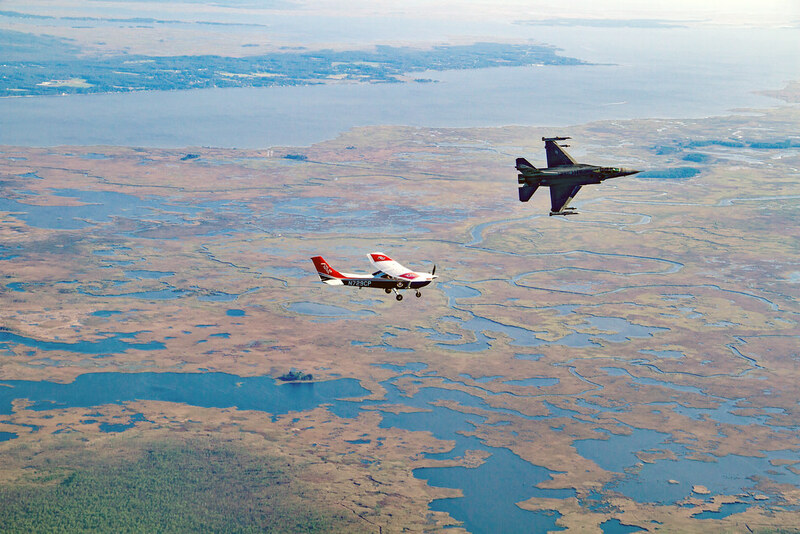 It’s an opportunity to exercise that air defense capability, not only for detection, but the scrambling and the vectoring of the fighters and ultimately the intercepting. We have missions that happen right here in the national capital region that help exercise the resources who are responsible for the defense of this particular airspace. Every 10 months, out at Fort Bliss, Texas, we do a similar thing–Falcon Virgo is the name. It’s preparing the air defenders, getting them trained up and they deploy here to the national capital region to perform those air defense missions. Search and rescue has certainly come all the way from World War II to the present as well. During World War II, there were border patrol missions along our southern border—that has not stopped. We work with Customs and Border Patrol agents, multiple times a week, at different times to keep it unpredictable, but we’ll fly border patrol missions all the way from Texas to New Mexico, Arizona, California with a Customs and Border Patrol agent on the plane with communications to the ground helping to safe guard the border. An aircraft from the CAP Southern Liaison Patrol scans the U.S.-Mexican border for any signs of suspicious activity circa 1943-1944. Then there is the basic theme of relieving the Air Force from the use of their resources, and in a much more cost efficient manner. 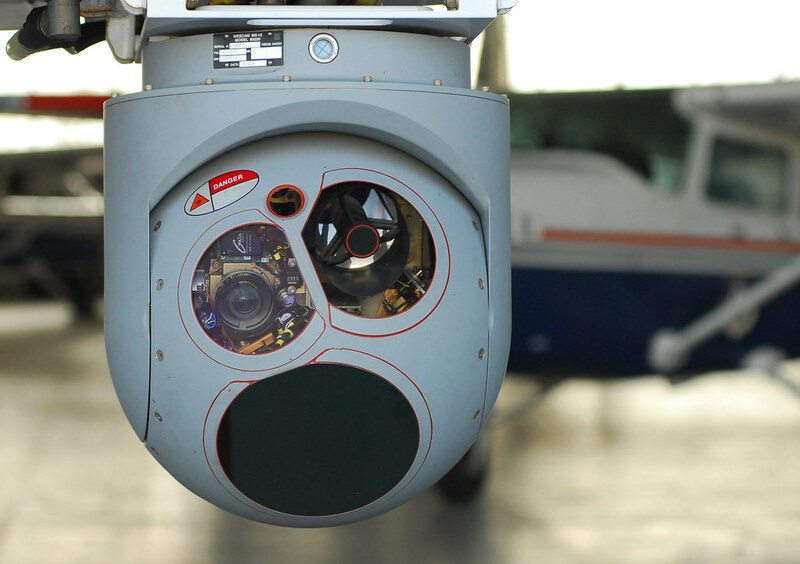 We have aircraft that are modified with a Predator sensor ball to provide that intelligence feed data and communications to our battlefield warriors for the training that they need. 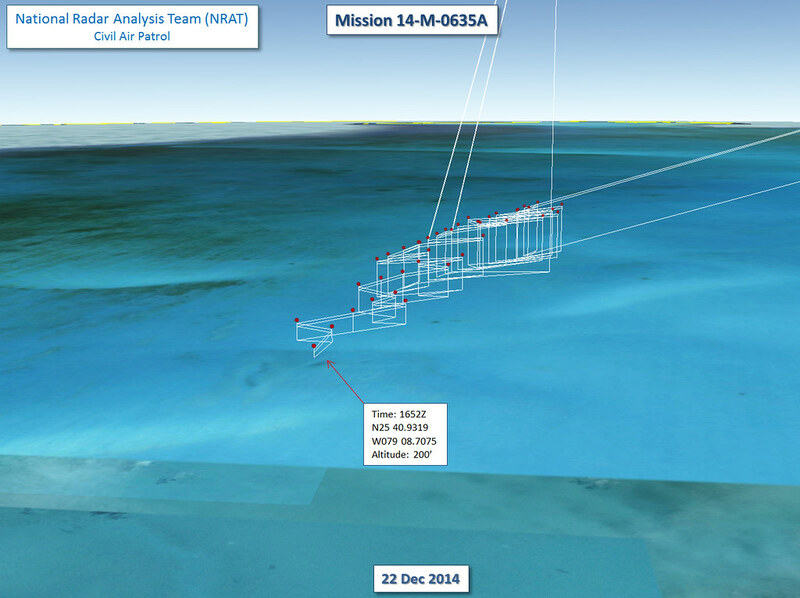 The actual unmanned aerial systems are a precious resource being used elsewhere. Also, (CAP performs) surveys of military low-level flying routes, range sweeps (and) chases unmanned aerial aircraft from their National Guard base through controlled airspace into the military operating areas. The Federal Aviation Administration still wants a “see and avoid” set of eyeballs going through that controlled space. So that’s just a sampling of some of the different Air Force related missions that we continue to do. You can trace the lineage all the way back to what we did in World War II. 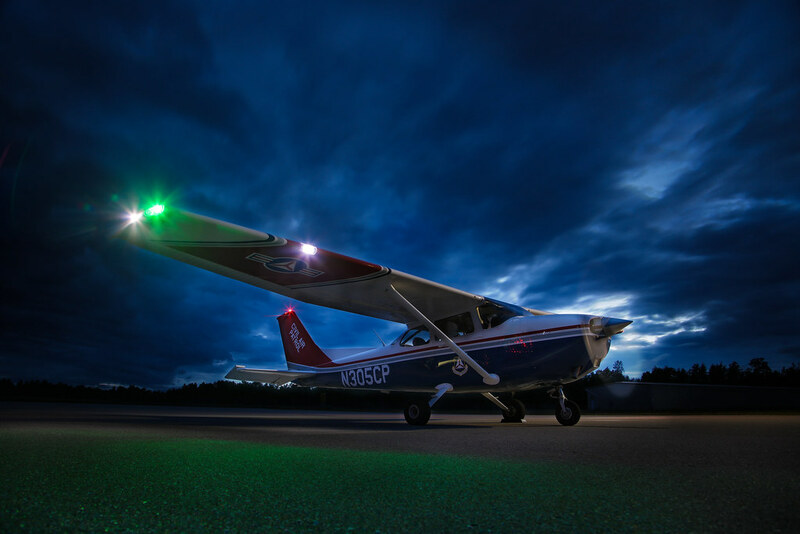 Airman Magazine: I would imagine that it is a lot cheaper to fly a Cessna 172 than a Predator. Maj. Gen. Smith: Absolutely. If you look at a disaster response and search and rescue and the hourly cost of operating anything from a C-130 (Hercules) to a UAV (unmanned aerial vehicle) to different helicopters, the cost is pretty significant and that’s just making the resource available in first place plus the operating and maintenance cost. On an hourly basis, on average, it’s about $165 (in flight and maintenance costs) for a CAP airplane. It varies a little bit on the type of airplane. Lt. Col. Brett Grooms (left) and Capt. Brian Rawl perform a route evacuation flight this morning over Interstate 26 in South Carolina as part of the South Carolina WingÕs preparations for Hurricane Florence. Grooms is the wingÕs homeland security officer; Rawl commands the South Carolina Legislative Liaison Squadron. Of course the volunteers are volunteers. They’re unpaid professionals who are passionate about going out and doing these types of things. So we’re a very cost-efficient option for the Air Force and for other agencies that may need some of those types of capabilities that we can bring to the table. Airman Magazine: Does CAP participate in Air Force exercises? Maj. Gen. Smith: Aircraft that we have modified with the Predator sensor, and the data link and communications that go along with that, are used in Green Flag East and Green Flag West out of Louisiana and Nevada. These airplanes emulate a Predator aircraft and provide training that’s needed, especially for those battlefield warriors. We are able to serve as targets, if you will, on the air defense side, the penetration of airspace, those types of things range all the way from a Red Flag or a Green Flag all the way to Super Bowl. They have the controlled airspace and before the Super Bowl the defenders will want to exercise their procedures, while we are (portraying) somebody who’s trying to penetrate (that airspace). This high-tech sensor package, installed under a CAP plane's wing or fuselage, allows the aircraft to mimic an unmanned aerial vehicle in military training exercises. Even on a presidential visit to a particular location, (the Air Force is) setting up that secure airspace and then using CAP to help to calibrate the defense of that particular airspace. Also, on the test and evaluation side of the house, with new radars, new sensors or new capabilities that the Air Force is interested in, they need an airplane to fly different places, altitudes, airspeeds, so they can do their data collection for test and evaluation. We’re a particularly affordable option for that type of thing. Airman Magazine: One of the other large issues the Air Force has been facing is getting pilots into the pipeline. How does CAP assist in increasing the supply of pilots; not only traditional cockpit pilots, but also RPA pilots? Maj. Gen. Smith: It’s a great topic. Certainly for the chief, that’s one of his top priorities. The Air Force pilot shortage, of course, is a subset of the larger worldwide shortage of pilots. So what can the Air Force do about it? As the civilian auxiliary, we have a seat at the table for helping to think this through and to be part of the solution as well. Imagine feeding a funnel, if you will, it’s not a linear pipeline. 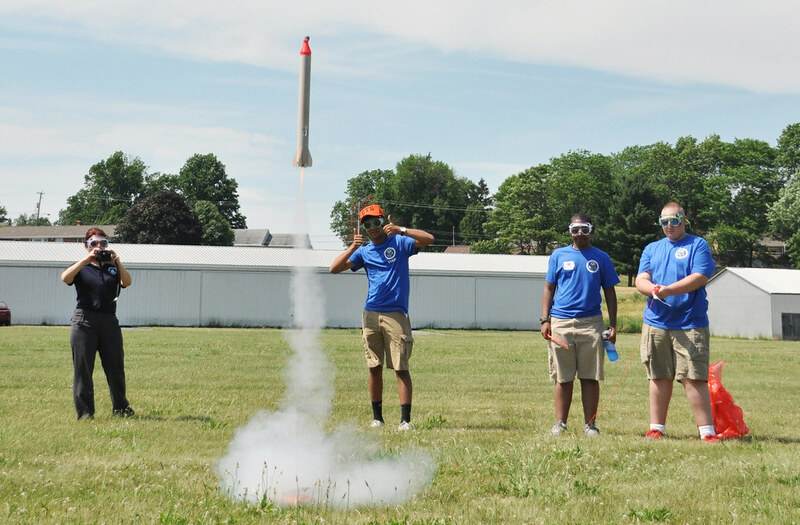 We can start right down there with kids and get them excited about STEM (science, technology, engineering and math) related materials, (building) a broad base of excitement and engagement with STEM—related things with an emphasis on aviation and aerospace. As that bubbles up, we have kids who are interested in flying as CAP cadets and they have the opportunity to receive orientation flights, both powered and gliders, at no cost to them. For the cadets who are really motivated, they have the opportunity to attend one of our flight academies—again, powered or glider. For the young people who have done well, shown the aptitude, they get a physical and do the ground test for the FAA ticket. We have the means to take them all the way through and fund them for getting their private pilot’s license and continue to fly them as they work towards getting into an accession program, whether it’s ROTC or the Air Force Academy or into OTS (officer training school) and then ultimately into the Air Force. The Air Force has invested in us to help make that happen. 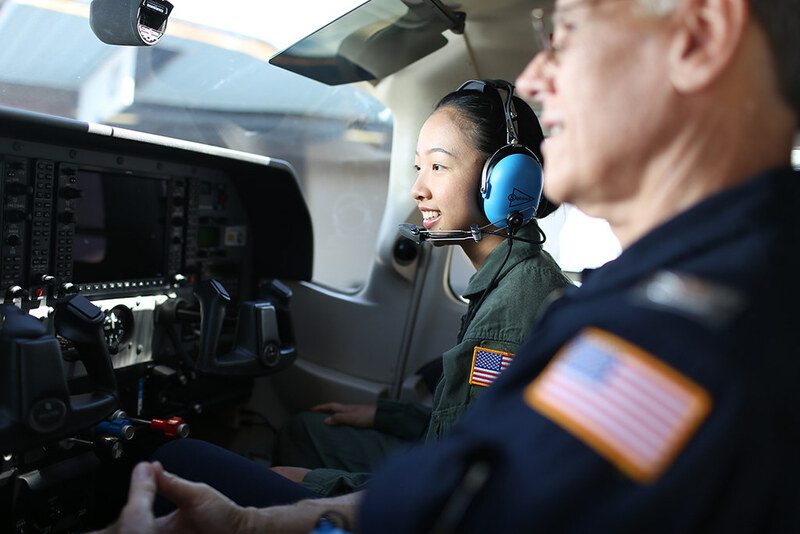 The flight academies provide opportunities for cadets who are underprivileged, underserved, who would not otherwise have the opportunity to go to a flight academy or learn to fly. Airman Magazine: How does the CAP address Air Force needs in other career fields? Maj. Gen. Smith: CAP has those three missions – emergency services, the cadet program and aerospace education. So when it comes to STEM and career areas of emphasis for the Air Force, they are parts of two mission areas, aerospace education and cadet programs. We work with the cadets and really get them fired up about aviation and aerospace. They’re exposed to everything that’s related to areas of interest to the Air Force. We work hard with teachers in schools, providing STEM related materials to teachers that they use in the classroom. That expands our reach. It’s part of the charter that we have to have an impact nationwide to the best of our resource abilities. We have 15 different STEM kits, 40 different aerospace education materials and resources that they can use. The STEM kits range all the way from fluid mechanics to robotics, computer programming, rockets, airplanes and unmanned systems—all sorts of things because different people get motivated by different things. There’s something there for most everybody to get them excited. 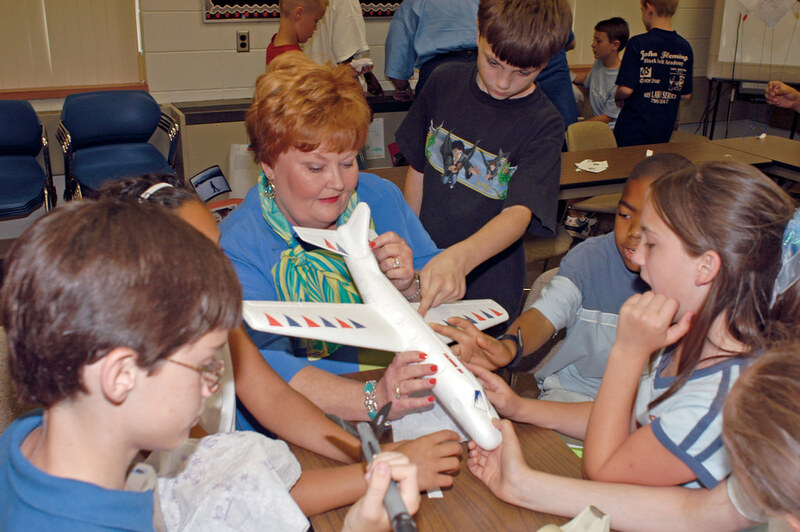 Schoolchildren admire the model plane they and their teacher built using a CAP aerospace education STEM (science, technology, engineering and math) Kit. For aerospace education, we currently have an impact of some 400,000 young people per year through teachers and the classroom. Our five-year goal is to exceed 1 million kids who are benefiting from these things. So that’s the aerospace education piece. 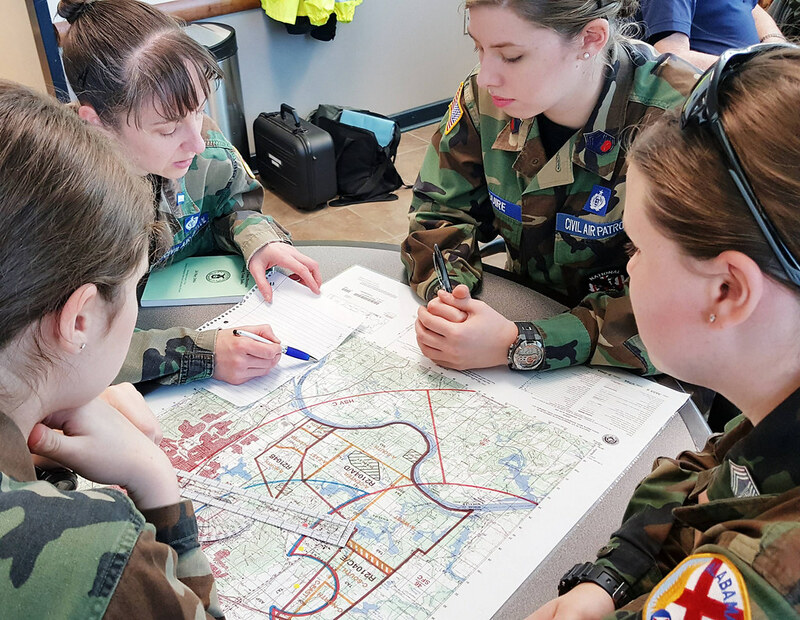 For the cadet program, the program basics are leadership, character, aerospace education and physical fitness, but there are also about 50 different types of what we call National Cadet Special Activities that are available. They run a huge spectrum in career areas that are of interest to the Air Force; mechanics, cyber defense, robotics, civil engineering and introductions to pilot training and even pararescue. The PJs (Pararescue Jumpers) are a wonderful community and very inspiring to our cadets. 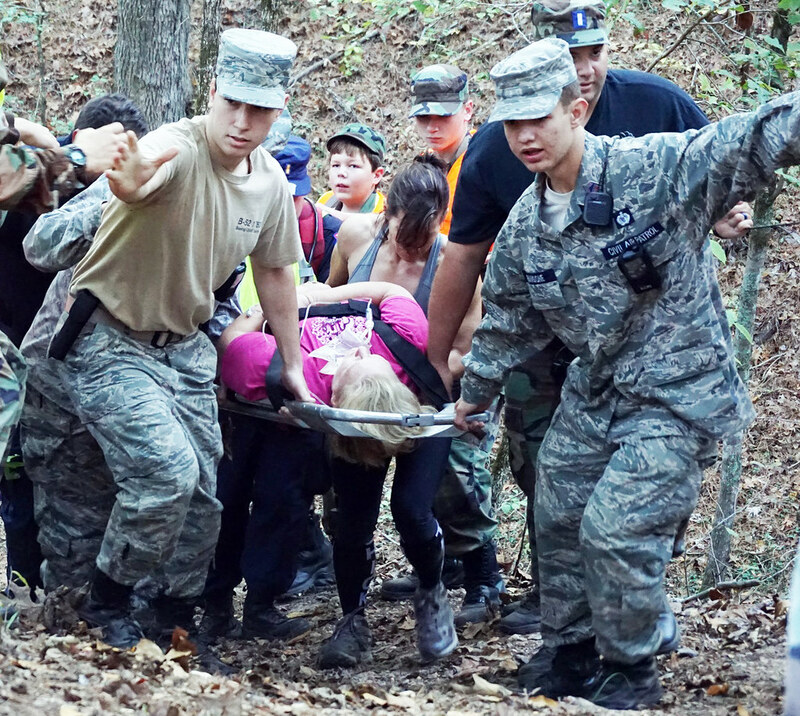 We have a basic course and an advanced course where the PJs and our staff have put programs together to where these cadets can get a flavor of that PJ experience; from the medical aspect to being inserted out in the woods and having self navigate and take care of yourself—the complete spectrum of the PJ experience. Airman Magazine: Do cadets have any opportunities for international experience? Maj. Gen. Smith: One of the most amazing programs that CAP gets to participate in is called the International Air Cadet Exchange Program. There are something like 17 different participating nations involved, ranging from Australia to China, Belgium, the United Kingdom, Israel, Canada; a wide variety of countries participate in this partnership. 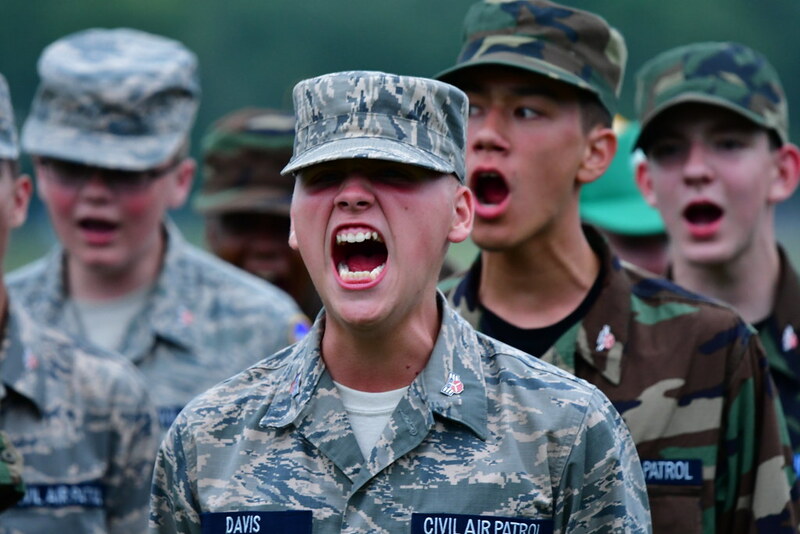 CAP cadets are the folks who participate on behalf of the United States. It’s a very selective process because we only have about 30 to 35 young people that we are able to send. Other countries will be sending the same number of cadets, young people who are into aviation, to all these different countries. We (hosted) cadets from seven different countries last year. It’s an amazing, life-changing experience for these individuals. They are not only serving as ambassadors of the United States, but developing lifelong friendships. There’s one individual who reached the highest levels of achievement as a cadet and is still an active supporter of CAP. His International Air Cadet Exchange exposure was in one of the Scandinavian countries. 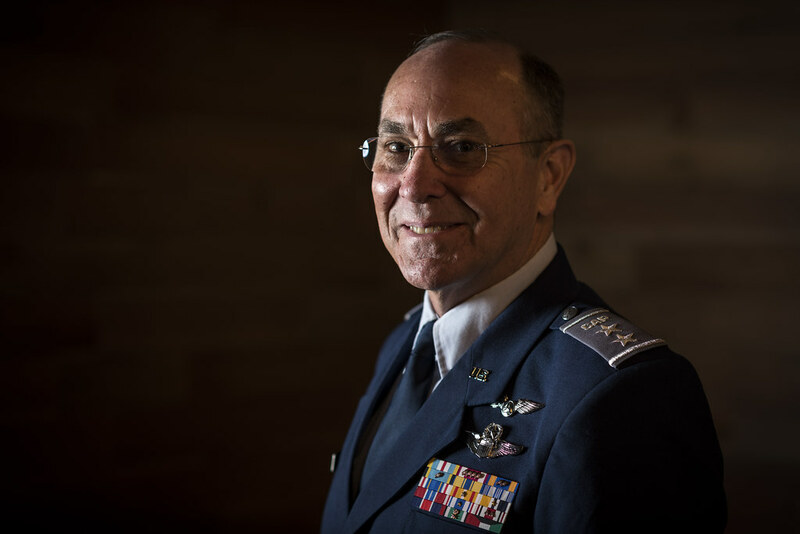 He developed friendships with folks from a number of different countries and has continued to work with them over the course of about 40 to 50 years; not only in the Air Force, but also in the business and the political world. Airman Magazine: What is the CAP’s role in search and rescue operations, whether they be local, state or federal level and what kind of technologies you employ to accomplish those missions? Maj. Gen. Smith: The technology has come light years. Back in the day, it was needle, ball and airspeed for flying the airplane and it was eyes outside the cockpit for trying to find what you’re looking for. The technology has come along which really enables us to provide a level of support and service to Air Force, FEMA (Federal Emergency Management Agency) and other emergency response and search and rescue, that just wasn’t possible before. Now what we have today is radically different, in large degree, because of technology that’s been brought to bear by CAP volunteers in two key areas. One is what we refer to as the National Radar Analysis Team. These are a group of volunteers who have developed software that takes the FAA radar returns and is able to fine tune that from the time that radar returns are lost to really narrow down the box to where they have a higher degree of confidence, where that missing airplane might be. The relationship they have with FAA, based on proven performance, is so good that there is a direct linkage between FAA and our National Radar Analysis Team to get them the information they need. We can provide that information back to the folks looking for that missing airplane and it (has) helped to find those folks much quicker than in the past. The other part is what we call the Cell Phone Forensics Team. These are volunteers who, because of their great relationships with cell providers, have been able to get proprietary data from the cell providers to do triangulation.Based on those little bread crumbs, a ping off a particular cell tower, they are able to fine tune, down to a pretty small box, where a missing person is. That could be a missing hiker, a missing boater or ship or someone who’s wandered away from a care facility who perhaps has dementia. Every agency involved in finding someone is working through the Air Force to get the use of cell phone forensics. With this technology we’re able to normally find the folks within hours instead of days, with much fewer resources incurred. It has resulted in many more saves. Last year, 158 saved lives, which is, since modern records have been kept, the largest number of saves that we’ve had. More than 90 percent of those had either or both Cell Phone Forensics and the Radar Analysis Team involved in making that happen. 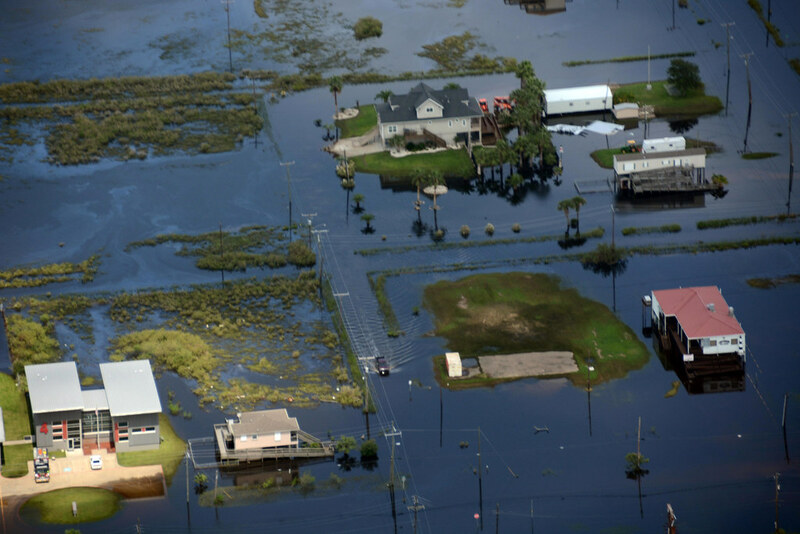 Every time there’s a national disaster, whether it’s a hurricane, a tornado, a flood or earthquake, CAP is involved.There is a good chance that the aerial imaging has been taken by CAP.We have folks in the air and we have ground teams supporting shelters and handing out goods. But let me talk about the airborne part of it again. With GPS, we can stitch the photographs together to get a mosaic. Our biggest user of those capabilities is FEMA. We’re able to provide the imaging so FEMA knows where they need to put their resources. Now, in more recent years, the types of technology that have come on board are spectacular. These are commercial off-the-shelf too, so it’s very affordable for FEMA and the Air Force to be able to put onto our aircraft. (This technology) is able to provide a three-dimensional video. It can be manipulated around. You can see, all the various angles and aspects of buildings—front side, backside. All that as the airplane’s doing its race track pattern up and down; not only with visual imaging, but also with infrared capabilities. The IR (infrared) is helping us to understand the level of damage, so it’s useful both on the search and rescue side of the house, as well as disaster response.In the geospatial imaging approach, there are software tools and methodologies to analyze thousands and thousands of images more quickly and more effectively than what you could back in the day. Airman Magazine: How are the search and rescue requests from federal, state, local agencies issued to the CAP? Maj. Gen. Smith: The Air Force has the Rescue Coordination Center at Tyndall Air Force Base (Florida), part of First Air Force. The requests will come in from the local level or through a state, but for us, as the Air Force Auxiliary, they come to the Air Force and ask for CAP to get involved in that particular mission.Whether it’s in support of FEMA in the case of a disaster response or in support of a sheriff’s department search and rescue folks. The requests come up to the Air Force. 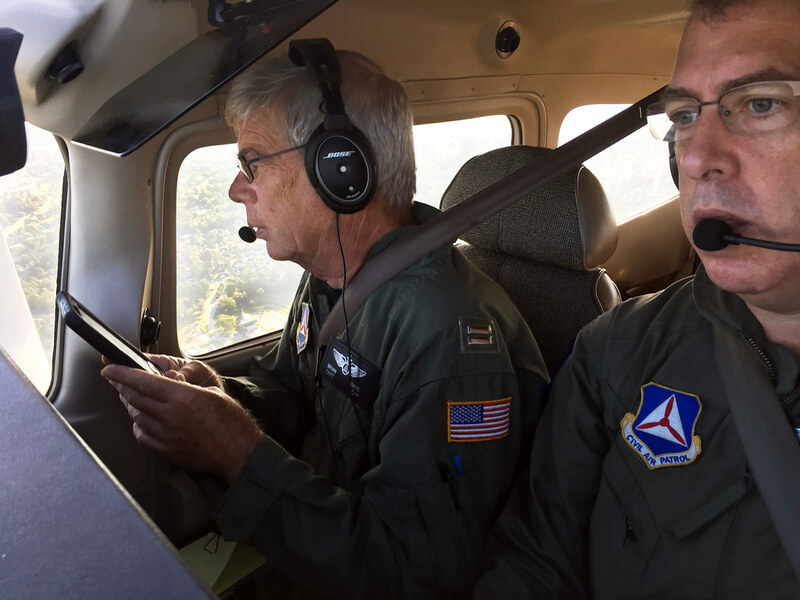 Airman Magazine: Could you talk more about Secretary of the Air Force Heather Wilson’s relationship to the CAP? Maj. Gen. Smith: I’m a big fan. She was previously the congresswoman from New Mexico—that’s where I live. I was the New Mexico wing commander. One particular time, I went out to a little bitty squadron in the middle of nowhere for one of their meetings. Who was there in the middle of nowhere handing out the awards to our cadets? None other than Heather Wilson. 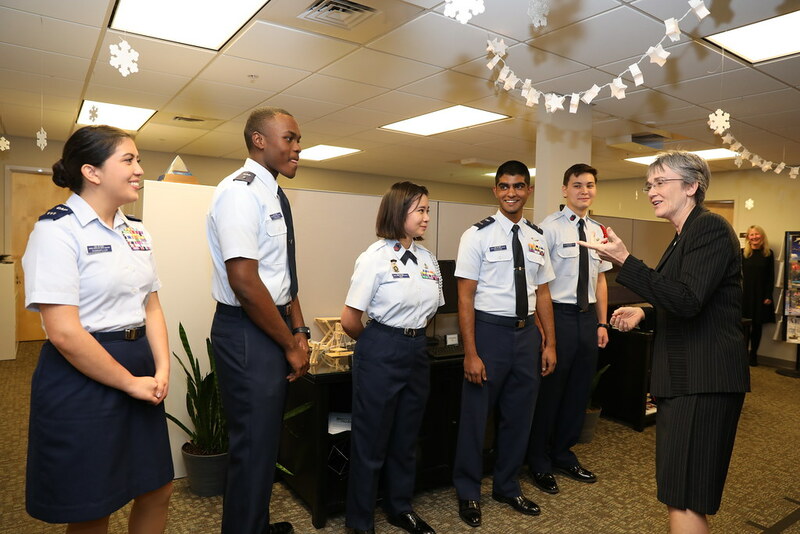 Secretary of the Air Force Heather Wilson greets members of the Civil Air Patrol at the CAP National Headquarters in 2017. She knows a lot about the CAP. Her grandfather, who was a World War I aviator for the British, immigrated to the United States after the war and settled in New Hampshire. In the World War II era, he became a volunteer for CAP and became the New Hampshire wing commander. He played an important role Heather Wilson’s life as she was growing up. He really inspired her towards aviation. He’s the one that she, as she tells us, talked to about the Air Force Academy. She went (to the Air Force Academy) and is now serving as our secretary and doing wonderful things for the Air Force and the Airmen, to include the volunteers as well. Airman Magazine: Is there a monetary figure that illustrates what the Air Force gets in return for funding the CAP? Maj. Gen. Smith: Yes. It’s about a four-to-one return on investment. Using the same type of methodology that volunteer nonprofit organizations use nationwide as a metric – what’s the monetary value of volunteer hours? Of course, when you look at specific platforms and missions, you have the relative operating and maintenance costs between one of our platforms versus an Air Force or a Coast Guard platform. There’s a huge difference there. It’s hard to quantify some other things—the cost versus benefit of a life saved with 158 lives saved this last year, or the cost versus benefit of preparing young people for success as the next generation of leaders. I would highly encourage people to look for an opportunity to get engaged with our cadets. Airman Magazine: Can you tell me about the experience of CAP Legislative Day for the staff, volunteers and cadets? Maj. Gen. Smith: On Legislative Day, which is roughly the end of February, beginning of March, each year, we will bring about 500 CAP folks, here to D.C. (District of Columbia). That includes a bunch of cadets as well. It’s an opportunity to have a contingent of CAP folks, both adults and youth, talk with elected officials in the House and Senate. The primary goal is to educate and inform those elected officials on what CAP is about, if they’re new. If they and their staffers are well versed about CAP, it’s about what’s going on back in their home districts and what CAP is doing.That’s an opportunity for us to advocate. Now for the cadets, it’s a unique insight to get to a basic understanding of the budget process. Cadets get to learn of differences in how the budgets are put together and (they) get a feel for how their elected officials fit into that process and which committees are working different things both on the House and the Senate side.They have an opportunity to make an impact in that and they are wonderful ambassadors. When you get a cadet in their uniform, the lawmakers can see what good is coming out of this investment in the CAP. Airman Magazine: What didn’t I ask you that you think we should know? Maj. Gen. Smith: In broad-brush terms, I’ll say that the Civil Air Patrol is proud to be a member of the Air Force Total Force. We have 61,500 volunteers who are passionate about being volunteer Airmen and making a difference for community, state and nation. We have tremendous support both from the Air Force and Congress, but it boils down to the spirit of the volunteer. CAP is unlike any other volunteer organization I’ve ever seen. They’re doing things that are helping on an operational level, whether it’s disaster response or search and rescue or developing young people to be highly successful and ethical leaders for the next generation. It’s an honor for me personally to be able to serve these folks in this particular capacity. 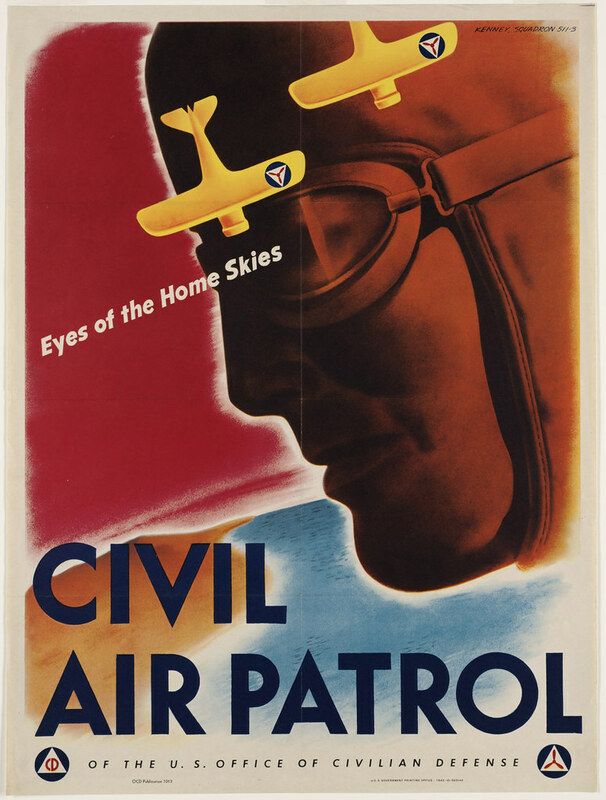 This iconic 1943 CAP recruitment poster was designed by V. Clayton Kenney of Cleveland, himself a member of Squadron 511-3 in Chagrin Falls, Ohio.  Archived in Command Interviews, History, Joint Force, MDC2, Operational, People, Total Force, Training and tagged Air Force, airman, airman magazine, CAP, Civil Air Patrol, cyber, disaster relief, history, hurricane katrina, leadership, pilots, search and rescue, technology, training, WWII. Bookmark the permalink.